Book Club: What is your Enough? Welcome to Week 1 of our online book club. (I’ve detailed the plan for this book club at the bottom of this post. Please share any suggestions.) 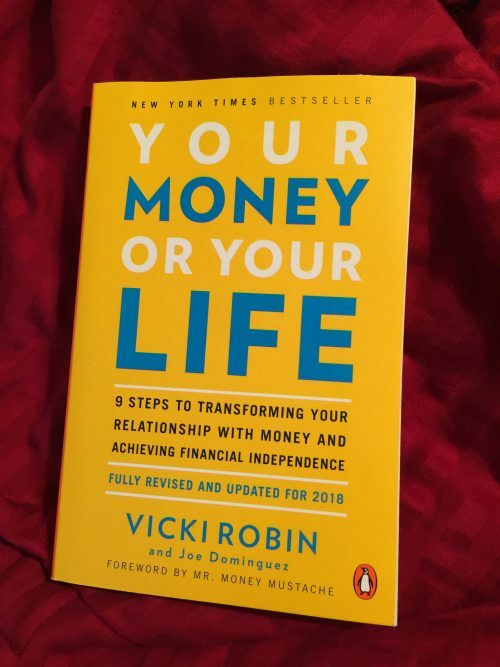 Your Money or Your Life by Vicki Robin and Joe Dominguez has really given me a lot to think about the last several weeks. These thoughts inspired me to begin tracking my spending and income religiously, made me wonder if I was having a mid-life crisis and so much more that we will get into. I have to be honest, I almost quit the book during the first chapter. With ten pages on the ecological affect of consumerism, I sighed and said “oh, it’s one of those” and almost quit reading. I am so glad I didn’t. Two really important questions are asked during this chapter. How much money have your earned (in your entire working lifetime?) And what do you have to show for it? The process for establishing these jumping off points are detailed and pretty intimidating. The results (in my case) were depressing. Thank goodness the mantra of “No Shame, No Blame” is pushed simultaneously. The author points out the difference between recrimination and discrimination when you are attempting to change unwanted behavior. I continue to revisit this as I work my way through the chapters actually doing the work! My Enough has definitely changed over the years. And even moreso this year than any other. I thought getting back into the corporate world, making 6 figures and so on would finally give me the fulfillment I was seeking. I was so wrong. That is not my enough. I’m still figuring out what is, but sometimes you need the process of elimination to really figure it out. Or is that just me? What messages did you get about money growing up? Where did you get them? 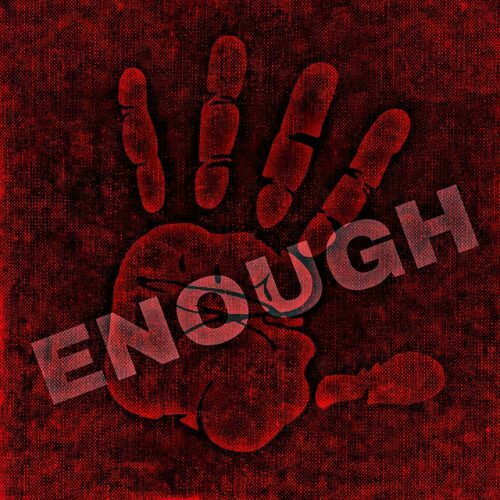 What does ENOUGH mean to you? I will post weekly on a new chapter. I will highlight what I found important and my personal take aways. Then I will post a couple of the questions provided by the book for discussion. Remember, there are no right and wrong answers, please share your perspective. Several days later, I will post my responses to those questions in the comments. It is important to me to hear your perspective and what your take aways were. I am really excited about this and this book in particular. Happy reading and writing! Chapter 1: What is Your Enough? Chapter 2: What are you Trading Your Life Energy For? I read this book a long time ago, at least 10, maybe 15 years ago. Even then it was pretty old. I’m not sure I ever made it all the way through, but I remember going through social security statements and old pay stubs to figure out how much money I had made in my lifetime. That part is laborious – unless it’s been changed now – figuring out the income you have made. It time-consuming, and could have been done with some shortcuts. Anyway, if I remember correctly, Joe Dominguez retired in his 40s with what today we would consider a very small next egg, and then died at 60 or so. (Correct me if I am wrong). That really impressed on me that you should always build in time to enjoy your life, whatever your definition of enjoyment and purpose is. I have internalized that concept in several ways, including looking at my budget every year and comparing my priorities to my spending. Do I spend more on eating out or traveling? Do I spend more on clothes or charity? Etc. I will recommend for another book club Elizabeth Warren’s “All Your Worth”. 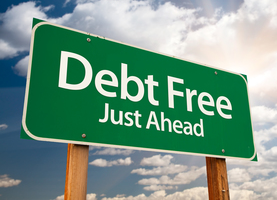 I do not remember it being political, but her Balanced Money Formula can really be a revelation if you’re in debt or getting out debt and feel like there is no money for fun or for your personal growth. It has been talked about on many personal finance sites. So I guess I never answered the question, sorry! I still have two definitions of “enough”. The first, and my primary driver, is enough to keep a standard of living about what I have now. I’m fairly frugal naturally, having grown up with significant financial issues, so I have lived below my means for my entire life (minus about 5 years when I went to grad school). Every time I get a raise, I am very careful about increasing my savings more than I increase my standard of living. The second definition of “enough” is the minimum that I could live on if I were to become disabled, the economy were to collapse, etc. If I had to, I could live on far less than I do now, I know I could because I have had to go back to that level several times in my adult life. It is not based on my income at all, but how much I would need to live a life with purpose, meaning, and enough comforts to be happy. I’m still waiting for my book from the library, but that doesn’t stop me from giving my “two cents”, lol. Growing up money was taboo – you never, EVER talked about money – to this day I have no clue how much money my father made. I wasn’t taught to respect money at all – I know my father made good money because we lived well, but we had bill collectors calling all the time because he didn’t want to take the time to pay the bills and my mother wanted nothing to do with it. NOT good financial role models! I feel lucky that my parents taught me what they did about money growing up. I saw my mom balance the checkbook every month since I was a child. They even bought me a kit to setup a “bank” at home, with checks I could write and a checkbook of my own to balance. When I got my first job in high school, my parents insisted that I save 25% of my paychecks. I hated that rule at the time, but I’m so thankful for having that saving mindset now. They also really harped on paying off my credit card in full every month once I got a credit card. I didn’t always do so well on that in my early 20’s, but I feel like I had to learn that lesson the hard way. In some senses it seems dated…and finding out how much I’ve earned is very easy because almost all of it was in my Social Security statement. But I like the concept of ‘enough’. I haven’t figured out quite what enough is to me. I feel as if we have enough money and should be able to retire comfortably. I look around me and it seems as if I don’t spend as much as others — I never get my nails done, we don’t spend money on redoing the kitchen, I don’t buy much in the way of clothes and we rarely go out to a fancy restaurant. OTOH we spend a TON of money — we have house cleaners twice a month, we take international vacations, we live in a 4 bedroom house even though the kids are grown and gone, we do eat out a lot, it is just at cheaper restaurants. And I guess I buy our kids ‘stuff’. So I’d like to cut back and figure what is enough. My husband is planning to retire in another year or so, so I will have to cut back then. Sigh….